Includes the lightweight, coldwater rated over-balanced diaphragm first stage, compact second stage and a matching octopus for a complete regulator set that just needs your choice of pressure gauge / console or transmitter added to get you ready for diving. The first stage builds upon the traditional Apeks diaphragm first stage using an over-balanced design for deliveries excellent performance. The first stage is environmentally sealed which in itself is great for increased coldwater reliability but the XL4 is also fitted with an over-moulded end cap that further reduces the risk of ice build up. The first stage is fitted with four low pressure ports and one high pressure port. The second stage and octopus are compact yet high performing. 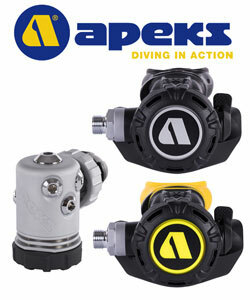 They are fitted with responsive balanced valves, diver adjustable venturi, a compact rubber exhaust tee and Apeks comfo-bite mouthpiece. The octopus is finished with bright yellow front cover highlights, mouthpiece and hose.